He began Fly Away AgriProducts Inc. in the dining room of his Jordan, Minn., home in 1997, designing and manufacturing screens for horse barn doors. To take his fledgling business to the next level he needed help, so he contacted Community Venture Network, an association of economic development directors representing communities outside the seven-county metro area. (The Network assisted entrepreneurs such as Sibbet who were willing to relocate from metro to outstate.) Through it he was wooed by sixteen different cities. He chose Blue Earth because of its generous financial package and, most importantly, its city-owned building that matched his production needs to a tee. “I was really sold on the building,” says Sibbet, 43 now, a man whose pent-up energy rumbles beneath the surface, much like a revved chainsaw before it cuts firewood. “It was a new, vacant building that had extra space for growth,” he adds, “and since we were in the sewing business, we needed a very clean environment, too.” All the other communities courting him had facilities that required extensive remodeling. Of course, the economic development authority’s financial package, including its seed money, also were instrumental in his decision. Emboldened, he moved his business from Jordan to Blue Earth “compliments of the economic development authority” and began manufacturing there on September 27, 1998. Labor shortages, he says, haven’t been a problem in Blue Earth where a Help Wanted ad can fetch up to 30 responses. (A recent one he placed for administrative assistant received 20.) Beyond the immediate labor pool of Blue Earth and its 3,800 citizens, he is also counting on the populations of Mankato and Albert Lea, both 40 miles away, and Fairmont, 20 miles off, for future employees. It has been easy to attract candidates because, unlike work in the construction industry, his brand spanking new facility is “clean, warm in the winter and cool in the summer.” He says the move to Blue Earth was certainly the “brightest” decision he could have taken. 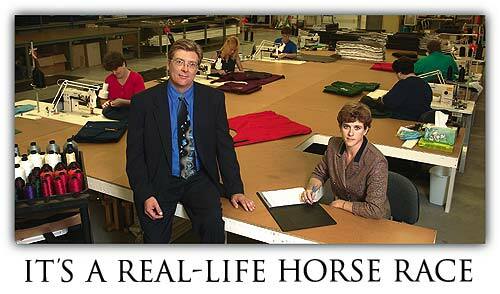 After cashing in his “fluctuating” homebuilding business in 1997, Duane knew for a fact he “wanted to be in an industry that really isn’t affected by fluctuations in the economy.” Horse people tended to be upper-income, with plenty of disposable income, and since he understood the horse industry as well, a transition into it seemed the logical move. So he began in his Jordan dining room, designing frameless screen doors for large 12′ x 12′ horse barn doors. What he eventually developed was a very strong curtain that doesn’t sag, made of high-tensile polyester and a flexible PVC coating. His curtains were better because they could be easily fitted onto older, hinged wood doors. To put in the traditional wood frame and aluminum system, older doors had to be removed first, which cost time and money. Then he sought out the Community Venture Network to expand, and since his dream was to enter the equine market – what he knew best – he was overjoyed when the City of Blue Earth offered him seed money and a clean, vacant building near I-90. All of which seems like an American success story in the making, just another typical Connect Business Magazine feature, except for the fact that he really hasn’t built up a solid reputation yet in the equine market. His success thus far has come almost solely from an unexpected, even udderly amazing product: the calf jacket. A Fly Away AgriProducts calf jacket retails for $55. Most are marketed through a worldwide distribution network that stretches from Japan to Egypt. (Three thousand were shipped to Japan alone last year.) Dairy farmers in the southern U.S. have been a good source of sales, buying the jackets to take the bite out of the damp southern cold. Their “unexpected” product, the calf jacket, has turned what was a summer seasonal company into a winter one. Company sales in 2000 are projected to reach over $800,000, nearly doubling from 1999. Most recently Fly Away AgriProducts was a corporate sponsor of the Quarter Horse Congress, held this year at the Ohio State Fairgrounds. It was the world’s largest horse show and sixth largest convention of any type, covering a 25-day span. Sibbet earned his corporate sponsorship by donating 600 linear feet of horse screen that will become the walls of what is normally a wall-less roofed riding arena. Each screen panel is 15′ x 25′. The screen not only keeps out flies, but also lessens the impact of sun, rain and wind on the riding area, creating a more pleasant experience for both rider and spectator. From the equine industry, the bulk of their sales contacts originate from trade shows and advertising placed in trade journals and magazines, such as Quarter Horse Journal and The Horse, a horse health magazine. They are choosy in placing magazine ads because of the cost, but feel the repetitive exposure is needed to give their one-of-a-kind product credibility with their target audience. The seasonality of sales to the equine industry can be tempered by selling to accounts in the southern hemisphere, such as in South America, Australia, and South Africa, where January is midsummer (fly season), and July midwinter. They take their business on the road. “In essence, our retail ‘store’ is where we are on any given day,” he says. “We just had a ‘store’ in Calgary, Alberta, for six days, and then it flew back to Blue Earth. We will have a store in Columbus, Ohio, at the next trade show. Our ‘store’ is the next show.” Trade shows are important because customers feel a need to touch their product’s fabric, and see it for themselves. It’s that new of an idea. While Sibbet flies away on his regular jaunts to trade shows, Alex Sucher, his Director of Operations, along with all his “wonderful people,” hold down the fort quite nicely. Besides calf jackets and horse barn screens, the company also manufactures vinyl doors for milking parlors, trail packs for trail bike riders, hay bags and horn bags for horses, and a turkey trailer containment system, which cuts down on litter and the spread of pathogens. Another unique product, manufactured for Featherlite, is a trailer screen for drop-down feed doors in horse trailers, which won an award at Equitana USA, a major Kentucky horse show. The company also won another award for its screen doors at Equitana USA, and an award at Equi-Fair, Canada’s largest horse show. The awards, doled out by top horse industry professionals, lend credibility to their product line, which in turn leads to improved sales. What hasn’t he sought patents for his products? “If somebody came in and stole our idea I would welcome it. We’re trend setters. If we had another competitor we would have greater market acceptance, and I’m certain it would boost our sales,” Sibbet says. © 2001 Connect Business Magazine. All Rights Reserved.